After graduating from Illinois State University and the American Academy of Art, Kevin set out on a free-lance illustration career which lasted thirteen years. Working mostly in the editorial area of illustration, his work consisted mostly of paintings for book covers and magazines. Some of his clients include: Penguin Publishing, Viking Press, Houghton Mifflin, Harlequin, Signs of the Times, Guideposts, Readers Digest, and Golf Digest. " I had always dreamed of becoming an Illustrator," explains the artist. " But the demands of painting someone else's ideas finally took it's toll. I decided that life is too short and that I had to paint from my heart. We're only given one chance at life, and I had to paint what was important to me. What's important to me," says Kevin, " Is that I try to capture a little of what God has already created in each of my paintings. One can obviously see the beauty of God's creation in nature, but for me it is even more profound when I see and experience that beauty in people." "Someday you'll find me out painting landscapes, but for now I love to paint the human figure. I find it stimulating to interact with my models as we explore ways to capture what might make an interesting painting. I often come to a modeling session with a preconceived notion of what I would like to explore, such as lighting, color, symbolism, or costuming, but it is usually the model that comes up with the most natural pose allowing more of their true selves to shine through." Kevin's training at the American Academy of Art in Chicago was his biggest influence on his art career. "Our training was in the classical tradition," he explains, " "we had two classes a day: a 3 hr. figure DRAWING session in the morning, and a 3 hr. figure PAINTING session in the afternoon. With training like that, it's hard not to fall in love with the human form. Whether the figure is clothed or unclothed, the artist must meet the unique challenge presented by both." Kevin says, " I believe there are endless possibilities when painting the human figure. Even if you were to paint the same model over and over, you can always explore and find something new and beautiful to express in a painting. I hope to express that same beauty I experience in my models to the viewer, so that they might also share in that same experience." Kevin Beilfuss lives in the Chicago area, where he lives with his wife Janice, and son Drew. 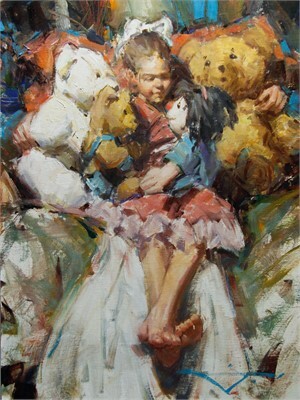 Says the artist, " Right now I am content with the joy (and sometimes frustration) I experience in the painting process. I am thankful that God allows me to be able to do something I have loved since childhood, and hope to enjoy the rest of my life."